A creepy twist to an iconic lawn ornament. 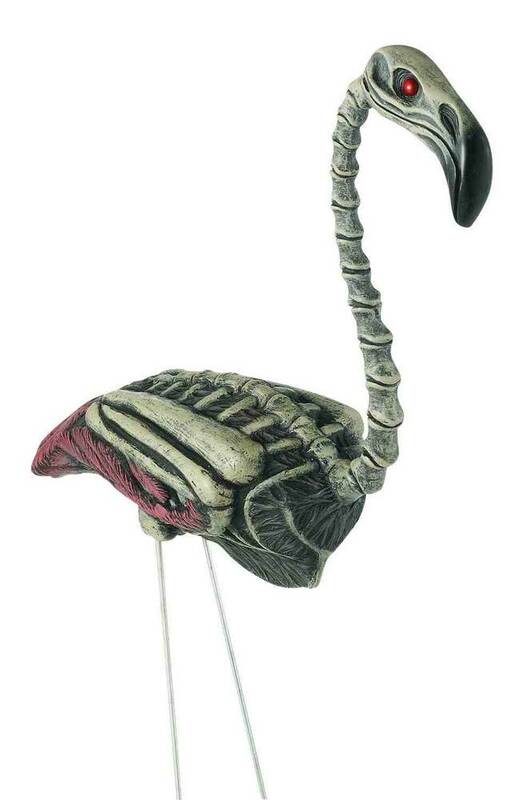 Put this plastic Zombie Flamingo in your yard and see how neighbors react! The flamingo itself measures 13'' x 11'' x 5'' without legs. Metal legs are 15'' long, making the total prop over two feet tall. Seemed smaller than I thought. Legs shorter then I hoped. Has a nice look but for the price I'd expect something bigger. Funny but the metal leg stakes needed to be popped through the underbelly of the creature. The indented holes were there but solid plastic inside. We assumed we had to pop into it, which made the metal legs go into the fully open cavity. Which means he kind of flops about and is also pretty Short considering part of his legs have to go into the dirt. Expected and wishing the legs went into something solid.